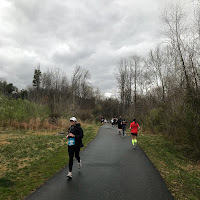 In preparation for a double marathon weekend at the end of April, I decided to load up my March and April schedules with weekends where I'd do 39.3 miles - a marathon and a half on successive days. That way, my body would be attuned to the wear and tear of the amount of mileage I'd be putting it through. I did a full and half a few weeks earlier with the Two Rivers Marathon and Philly Love Run, so this time I decided to switch them around to do the half first, and the full second. At the same time, I got to book a national anthem gig to check off the state of Virginia in the process. 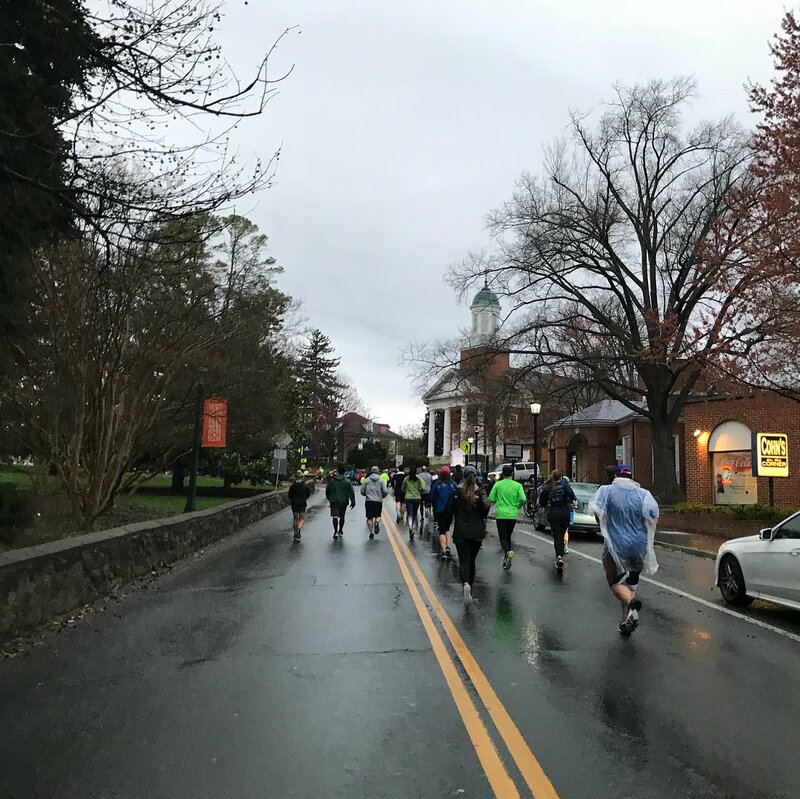 First up was the Charlottesvillle Half Marathon, home of the University of Virginia. 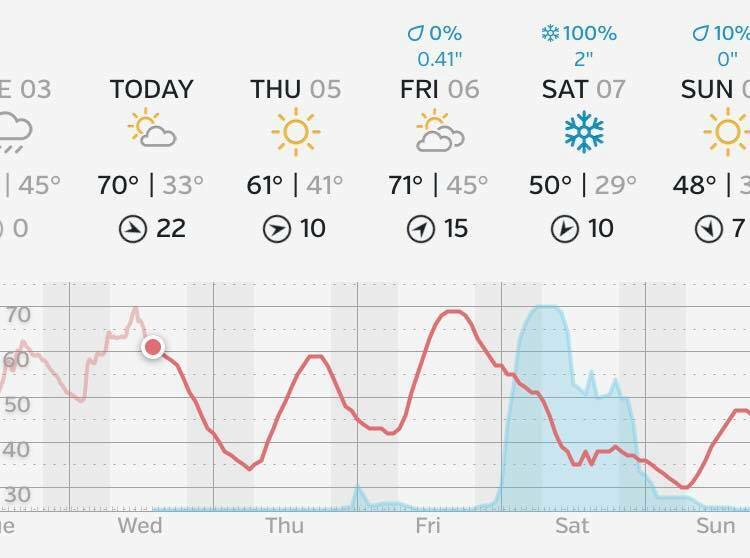 The weather forecasts in the week prior to the Charlottesville Half Marathon seemed pretty dire. With temps seemingly plummeting, high winds, and precipitation ranging from rain to snow, it was difficult to determine what to wear for the race, let alone where I was going to stay. 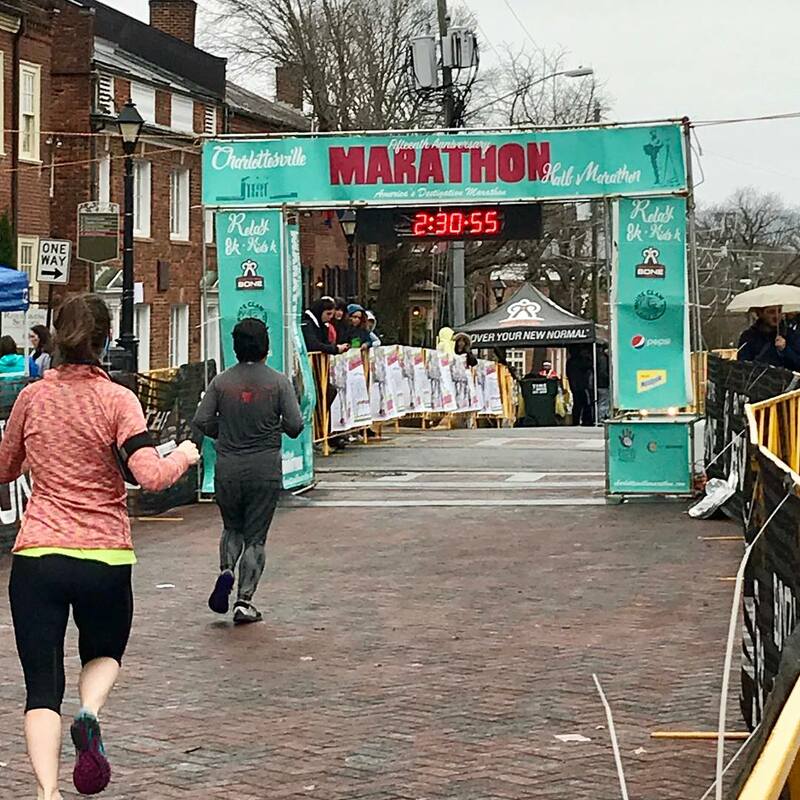 Initially, I had gotten in touch with my friends Patsy and Kerry, parents of my friend Caitlin, who would house me the night before the race in Staunton, about 45 minutes west of Charlottesville. But with the weather forecast as it was, they suggested I look at alternative means of accommodation (the road from Staunton to Charlottesville was over a mountain pass that could close for inclement weather.) With most of Charlottesville hotels booked up or super expensive, I ended up last minute contacting another friend Glen, who lived 45 minutes to the east, in the town of Kents Store. He had told me a couple weeks before at the Two Rivers Marathon that he was going to be in town to do the race, and that if I needed a place to stay, that he had a spot for me. The route from Kents Store in Louisa County to Charlottesville was significantly better and did not have mountain passes to deal with, so I came into Virginia with the plan to stay at Glen's. These temps don't look promising. Three days out, and the weather on Saturday was looking to be pretty wet, turning into snow at 10am. 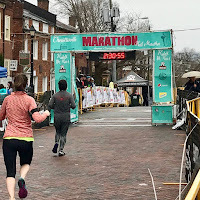 As the weekend was going to be a double weekend for me, I was slated to fly out of Charlottesville at 12:30pm after the race to get down to Atlanta before connecting on to St. Louis for my Sunday race. I was landing pretty late on Friday night, and upon landing, the pilot had warned us of high winds, warning us to be careful as we exited the plane down the stairs and onto the tarmac. I drove through the hilly back country roads carefully, as I made my way to Kents Store, and promptly went to bed in the detached single room "cabin" behind Glen's house. Through the night, I could hear the wind pick up and the rain start to fall, making me very anxious about the weather on Saturday morning. When I woke about five hours later, the wind had died down (mercifully), but it was still raining a little bit. Glen, and his two houseguests Cade and Jennifer, all running the marathon, were up and getting ready for the race. I decided to leave first and took Glen's advice to park somewhere near the First Presbyterian Church along Park Street - my initial research revealed that parking in downtown Charlottesville was complex and subject to potential fines for parking without a permit in certain designated areas. I decided to park a couple blocks from the start in street parking, knowing that I could get a fine, but it would only be $25, if anything. It was actually quite nice in the morning prior to race - only 48° with thankfully no rain - I dressed in a single longsleeved shirt, and some long tights. 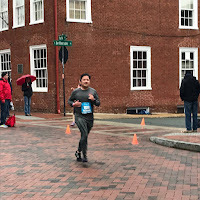 I headed over to the start area in the Historic Court Square area, the oldest portion of the City of Charlottesville, where some of the buildings date back to the early 1800's. 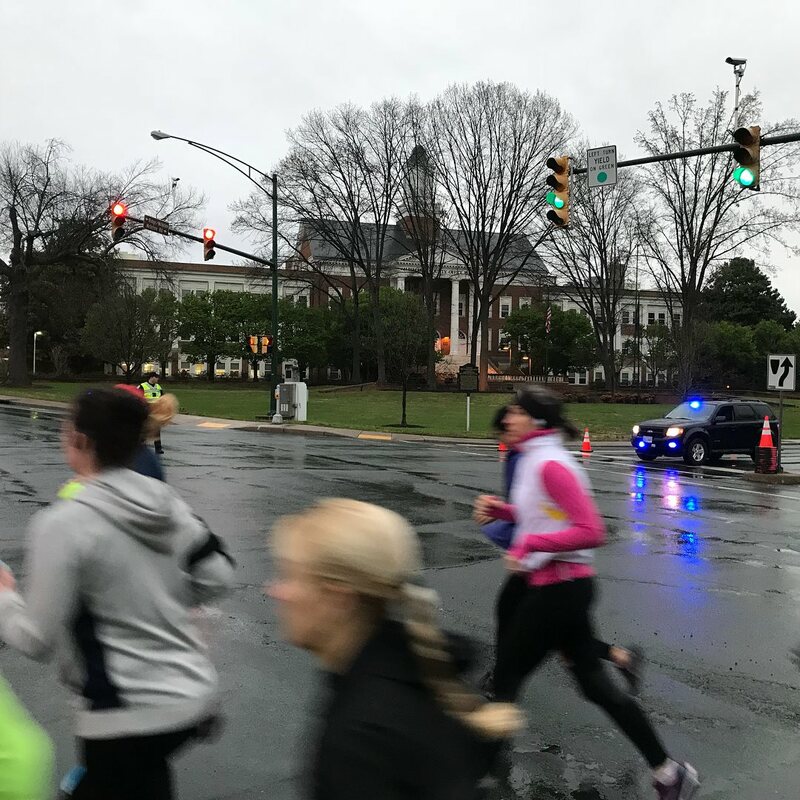 The start and finish line was located directly in front of the Albemarle County Courthouse. There, I met up with Patsy, who was preparing for the 8K. She was able to make it with no problems from the weather over from Staunton. Patsy was going to wait for me to finish, and I estimated that I would be done at about 9:30, 2 1/2 hours after the start. I made myself known to the race director, Francesca, located at the startline, and at about 6:45, readied myself for the national anthem - effectively checking off the state of Virginia with my rendition. After singing, we were off! 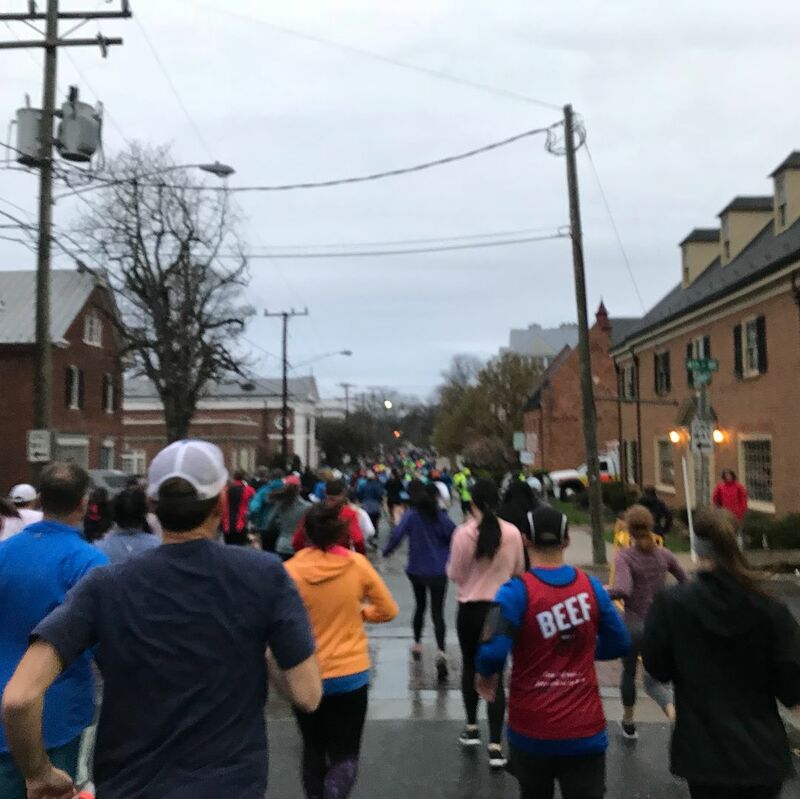 We headed west along Jefferson Street, past Justice Park and Emancipation Park (the two parks with controversial Confederate statues that dominated the news media in 2017), before taking a steep downhill road as we ran along Preston Avenue past several old buildings in Charlottesville's historic district. At the bottom of the hill was the Albemarle County Office Building, a building which used to house the main high school up until the 1970s. The route then had us turn left along Ridge McIntire Road, and then right through the West Main Street Historic District, a commercial corridor and important connection between the University of Virginia and Downtown Charlottesville, and to its surrounding neighborhoods. As we passed through another commercial district known as The Corner, we gradually climbed up along University Avenue until we reached the 1 3/4 mile mark near the University of Virginia's Rotunda, about 125 feet higher in elevation than at the bottom of the hill. The Rotunda, a building located on The Lawn on the original grounds of UVA, was originally designed by Thomas Jefferson in 1822, later rebuilt in 1898 with a modified design by Stanford White after it had burned down in a fire, and then gutted and completely rebuilt once more in time for America's Bicentennial in 1976 to Jefferson's original design. It is also, along with Jefferson's home at Monticello, one of only three modern man-made sites in the US to be internationally protected and preserved as a World Heritage Site by UNESCO. Modeled after the Pantheon in Rome, it was designed to house the library and be flanked on either side by faculty pavilions, interspersed with student rooms. 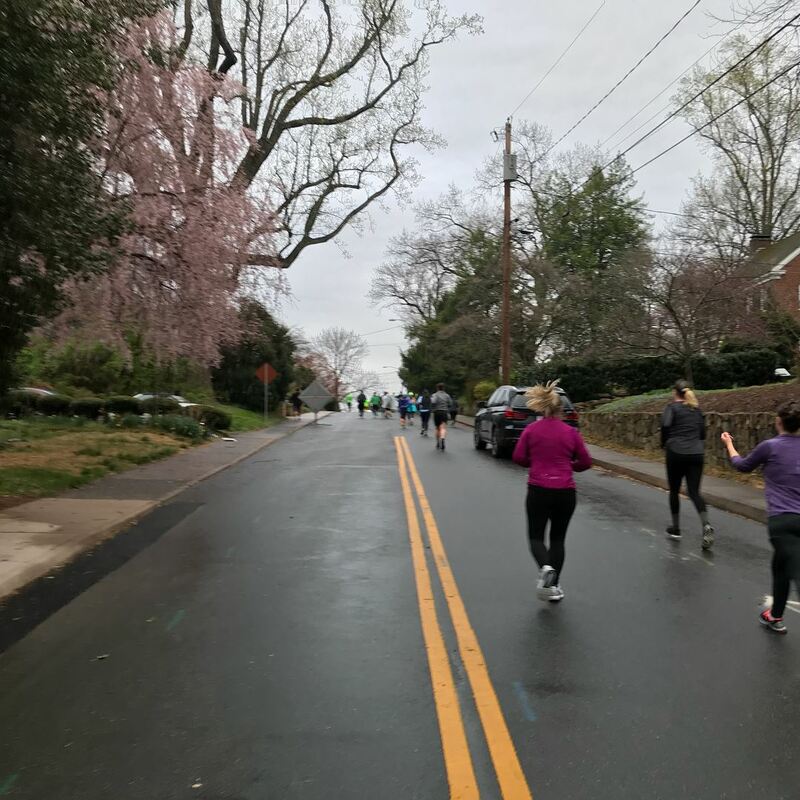 We turned right onto Rugby Road, taking us past the Fralin Museum of Art, before turning right once more onto Gordon Avenue, as well as the highest point in the entire race, at 574 feet in elevation. 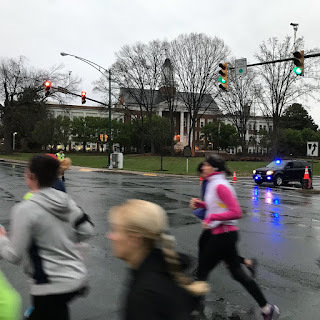 After taking a short turn that took us along Grady Avenue, we had a nice steady downhill as we returned back to the corner of Preston Avenue and McIntire Road, where the Albemarle County Office Building was. I reached the 5k mark at around 33 minutes, as we turned left onto McIntire Road. The route took us through the largely residential part of the North Downtown neighborhood of Charlottesville, curving from McIntre Road onto Perry Drive, then a short steep climb up to Northwood Avenue and Evergreen Avenue, past many beautifully restored homes, replete with the character of the history that defines the city of Charlottesville. We curved our way around to Lexington Avenue, and then turned left onto Poplar Street, while we could see the 8K runners continue straight up a rather intimidating looking hill. The marathoners and half marathoners alone now, we would begin a long out-and-back section that would be roughly 4 miles to the turnaround point for the half marathon runners. 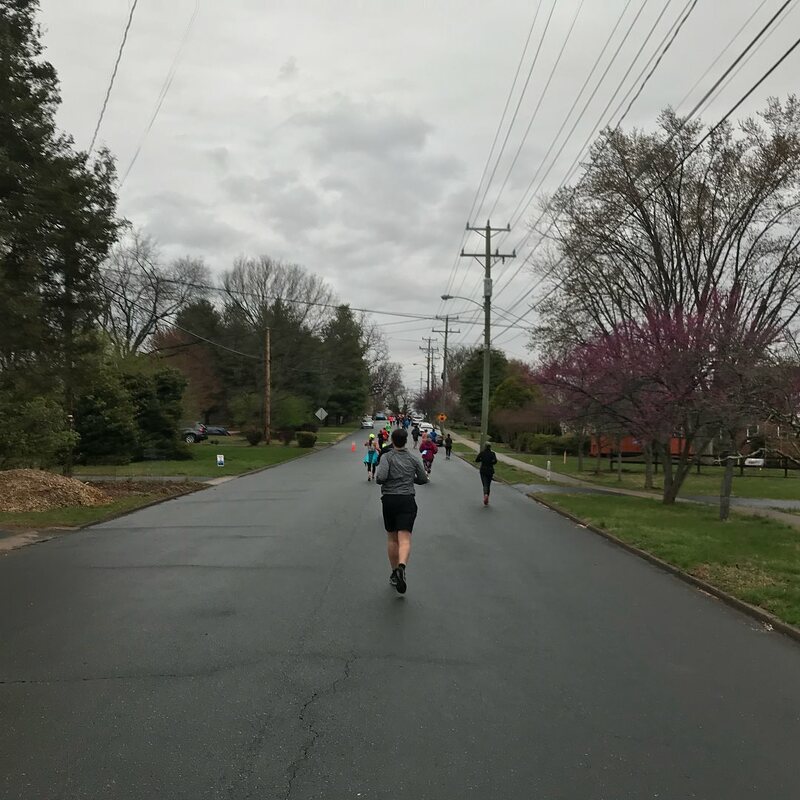 From Poplar Street, we were turning left onto the continuously rolling Locust Avenue, beginning a one mile long straight shot into the the residential neighborhood of Locust Grove. 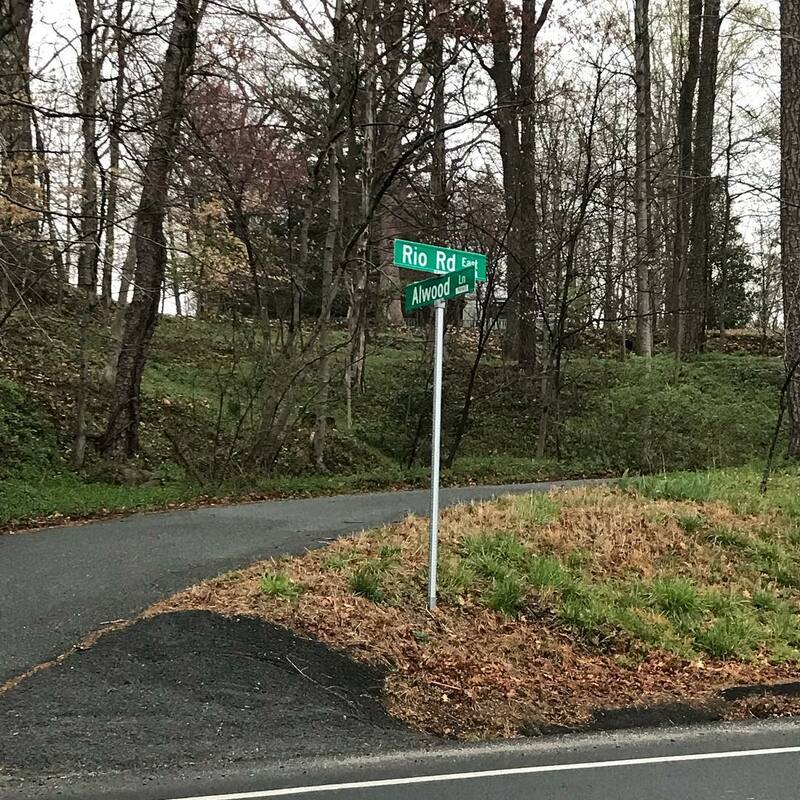 Most of the homes here were built between 1940 and 1970, and you could tell the difference as we got to the end of the section on Locust Avenue before turning left onto Locust Lane. We reached a cul de sac, and ended up having to run through a very narrow pathway between houses before emerging on the other side onto St. Charles Court, which after a slight curve became St. Charles Avenue. The course zigzagged as we progressed further into the neighborhood, passing Northeast Park. As I made my way past the 6 mile mark, the fastest runners of the day were on their way back, some five miles in front of me. We completed a short out and back along Sheridan Avenue (which ultimately got really confusing with runners going out to the turnaround in different directions), before curving up to Holmes Avenue. The road rolled up and down quite a bit as we made our way further up along Agnese Street, then finally emerging out of the residential neighborhood onto Rio Road (pronounced Rye-oh, as we are in the south), a road that connected to Park Street. It's pronounced "Rye-oh," not Rio like Rio de Janeiro. 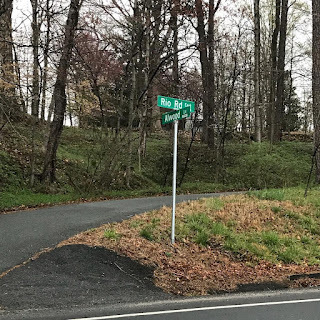 Before it became Park Street, though, we turned right onto Melbourne Road, proceeding half a mile up the road to the John W. Warner Parkway, where we would get onto a section of the Rivanna Trail that skirted Meadow Creek. The asphalt trail rolled as well, unsurprisingly, as we continued north up the path up to the turn around point a little over a mile later. Ultimately, the Rivanna Trail is a 20-mile rustic "urban wilderness" hiking trail built and maintained by volunteers that encircles the City of Charlottesville. It meanders through forested buffers that protect the City's streams and rivers, serving as a community-wide resource for play, exercise, relaxation, and nature-related recreation and education. 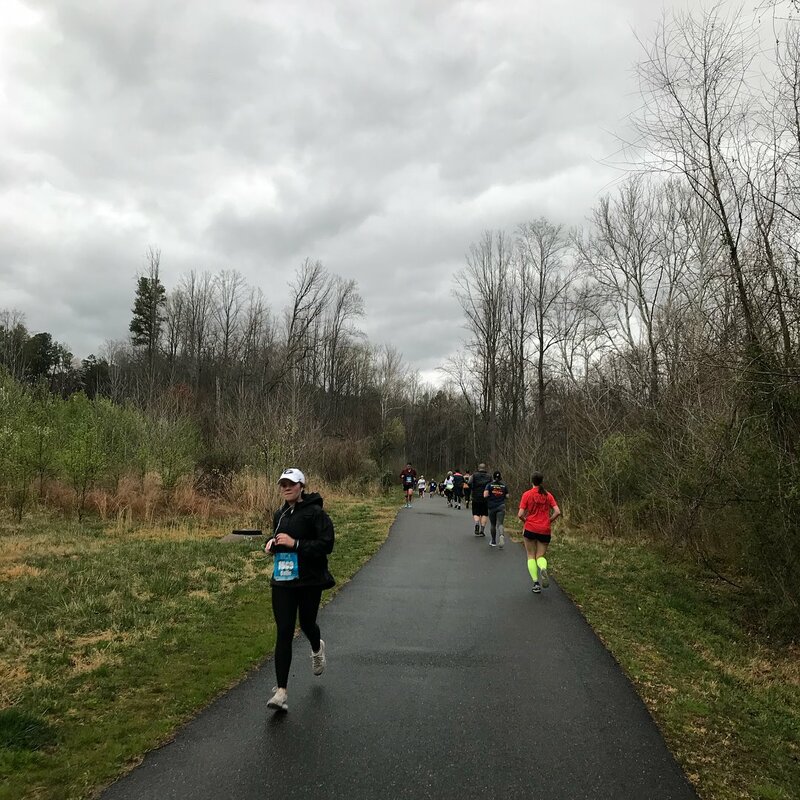 The Trail passes through many neighborhoods and connects six City parks, but for the half marathon, would only run along this roughly one mile section of trail. 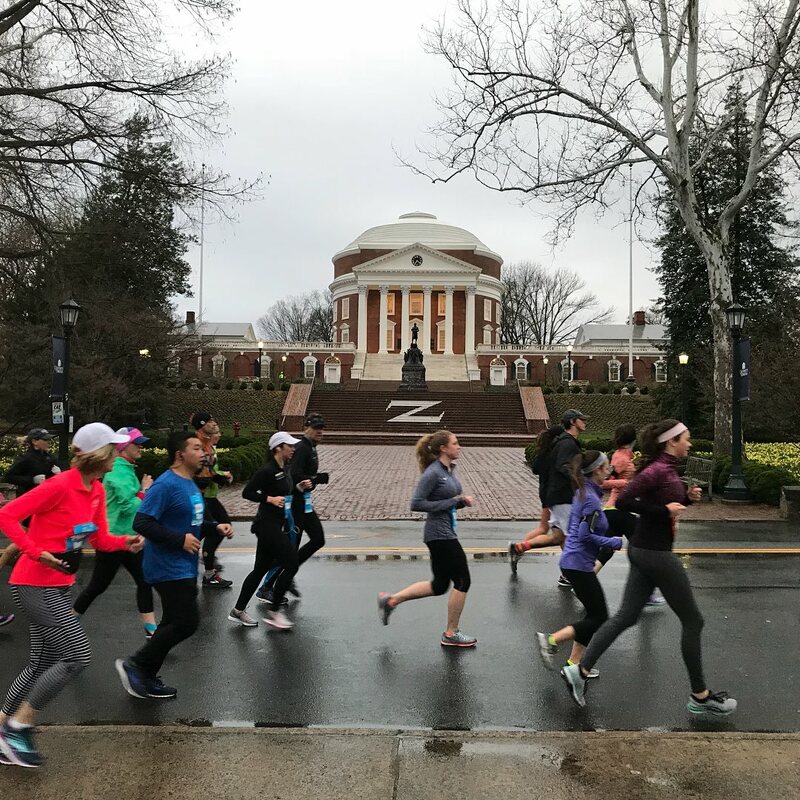 The marathon would continue on north, completing an eight mile loop around the suburban community of Rio, northeast of Charlottesville. The trail crosses Meadow Creek on the Parkway Trail Bridge, then does a couple switchbacks heading uphill before a downhill section toward the turnaround point for the half marathoners. The four mile return back felt easier, as there seemed to be more downhill sections to run; but perhaps because there were far fewer runners to encounter on the running back? As we made our way on the one mile section on Locust Avenue, I managed to run some of my fastest continuous pace of the whole race. To make matters worse, it began to rain for the first time in the whole race. 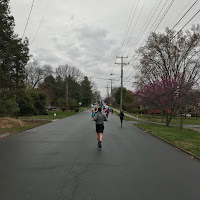 It continued to rain as we hit Poplar Road and returned back onto the path that we had seen the 8K runners continue along. All the way to the end, as we zigzagged back toward Historic Court Square, it was a gradual uphill, climbing 80 feet over the last 1/2 mile. We made the right turn from Lexington Avenue onto Maple Street, passing Maplewood Cemetery, Charlottesville's oldest cemetery, as we continued to struggle up the hill, charging ever so closely to the finish line. A few more slight turns, and we were back to where we started, and I crossed the finish line, fantastically predicting my finish time in a nearly precise 2:30:15, just as I told Patsy I would be finishing in. This finish time on a hilly race (which I'd later analyze to include some 930 feet of elevation gain and 945 feet of elevation loss), would bode well for me in preparation for the fact I had another race the next day. 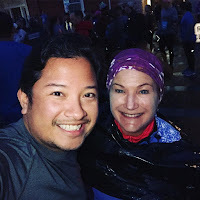 Patsy met with me after the finish chute as the rain continued to fall onto Charlottesville. 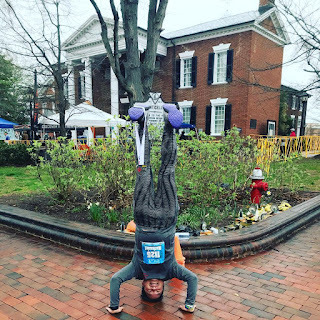 I was super hungry, and quickly gobbled down a couple slices of pizza as I contemplated where to take my headstand photo, and ultimately decided to take it near the Albemarle County Court Building, and in front of the historic old city center of Charlottesville. It felt fitting to make my headstand photo here, and not in front of a controversial statue. Also I didn't think to have it done in the more contemporary center of town at the Downtown Mall, a pedestrianized street only a few blocks away, since the course didn't go anywhere near it or even on it (unlike some other races that did go through main city centers like Burlington or Knoxville). The rain continued to fall, and I still had to gas up the car and return it, so I decided to just head back to the airport with about two hours to spare. With my flight still scheduled for departure at 12:30, and the temps staying steady, I was feeling good about an on-time departure, and being able to get out of Charlottesville before any chance of potential snow would come through. At 12:30, I was off to Atlanta to connect to my flight to St. Louis, ready to take on race two of the weekend. Victory Headstand near the start/finish line!